The brief was really open and there was no specific outcome or deliverable. After researching into all of the words, I decided to produce work on the word dominate. Specifically looking into food chains, predators and prey. I begun by researching food webs on the internet, but soon decided I wanted to focus more on British backgarden wildlife and food chains found there. I found the RSPB website really helpful with an a to z of wildlife found in a typical garden. 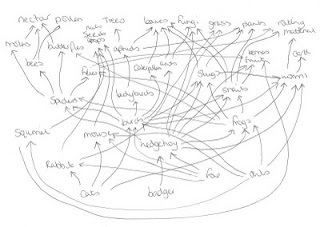 Allowing me to start to build up a diagram of a food web from which to base my work. Here is a beautiful doodle by Kat. I think its one of her best pieces!